He is likely headed to live in exile. 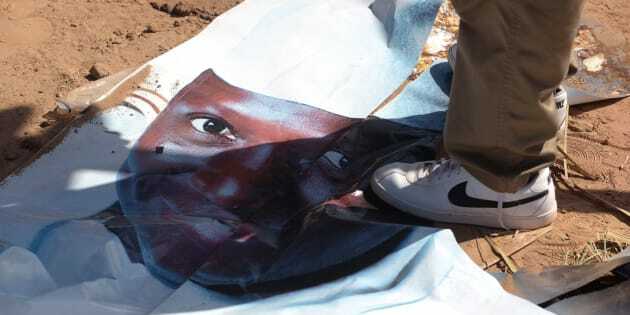 A man walks on a ripped electoral poster of Gambia's outgoing president Yahya Jammeh, in a street of Bijilo, on December 4, 2016. BANJUL, Jan 21 (Reuters) - Gambia’s former leader Yahya Jammeh flew into exile on Saturday after stepping down overnight under pressure from West African nations to accept he lost a December election to President Adama Barrow. Jammeh made no comment at the airport and the destination of the jet he boarded was unclear. He was accompanied by Guinean President Alpha Conde, who mediated the terms of his departure with Mauritanian President Mohamed Ould Abdel Aziz and others. The departure of Jammeh, who took power in a 1994 coup, ends weeks of stalemate and paves the way for the transfer of power to Barrow, who was sworn in as leader at the Gambian embassy in Senegal on Thursday and is now expected to return home. The events will likely be viewed as a triumph for African diplomacy, in part because there was no fighting between the 7,000 troops from Senegal and Nigeria who entered Gambia on Thursday and the authoritarian leader’s forces. As a price for leaving, Jammeh demanded amnesty, the right to go to and from Gambia and recognition for his political party, said Marcel de Souza, head of the commission of West African regional bloc ECOWAS. “(An amnesty deal) is not finalized. The heads of state would have to give it and the AU (African Union) and the U.N. (United Nations), and it would surprise me if that is given,” he told Reuters in Dakar. The deal over Jammeh’s departure focused on where he would go into exile and the issue of amnesty, mediators said. Jammeh’s departure will relieve tension in Gambia after a day in which many people said they feared the veteran leader might change his mind. He initially conceded defeat to Barrow in the Dec. 1 election but backtracked a week later. Some in Banjul said they were angry he was able to negotiate at all and had been allowed to delay his departure. In a last bid to cling to power, Jammeh declared a state of emergency this week and dissolved the cabinet while the National Assembly extended his term for three months. More than half the government then resigned and 45,000 people fled to Senegal. The crisis was a test for ECOWAS, not least because Jammeh had held office longer than any other current president in the grouping of states. The African Union and U.N. Security Council supported the military intervention.